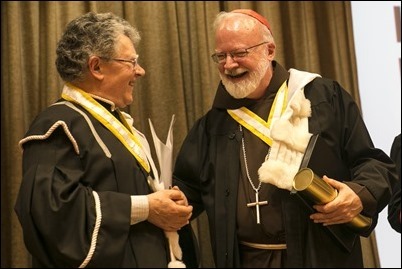 As regular readers will remember, last week I had been in Rome of meetings of the C9 Council of Cardinals. 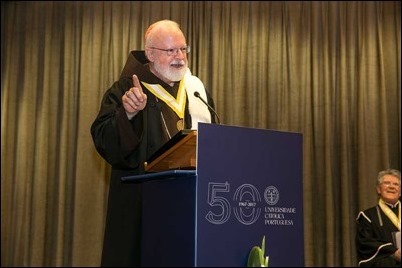 On my way home on Saturday, I passed through Lisbon for a day because the Catholic University of Portugal, which is celebrating its 50th anniversary, had invited me to speak at a convocation they were holding. 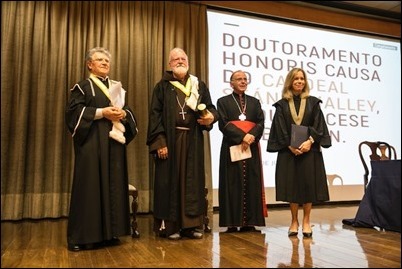 At the convocation, they presented me with an honorary doctorate. 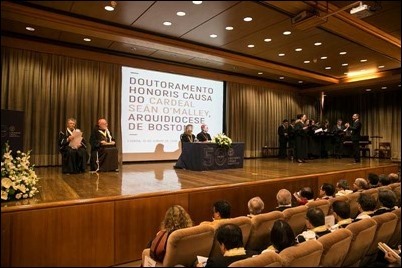 In fact, the first honorary doctorate they ever gave was to also to the Archbishop of Boston: Cardinal Humberto Medeiros, and the auditorium where the ceremony took place is named in his honor. 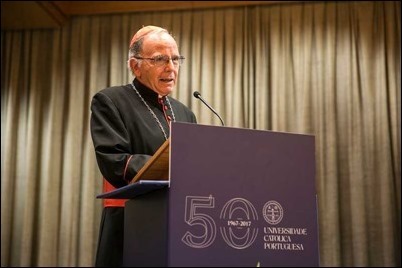 The university was founded by the bishops of Portugal following the Portuguese Revolution, at a time when there was great concern over the growing communist influence in the country. 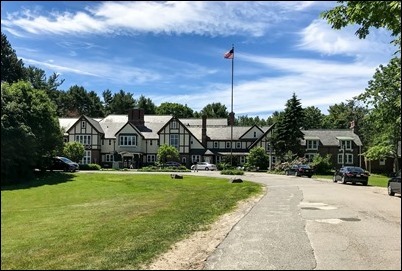 Here in the States, the Association for the Development of the Catholic University of Portugal (ADCUP, for short) was formed to help in the establishment of the university and they received a great deal of support from the Portuguese-American community in the Boston, Fall River and Providence areas. Today, they have several different campuses around Portugal, and it has become one of the finest universities in the country. It is really thriving. I was very honored to be given this doctorate. 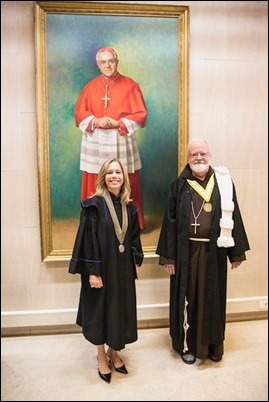 European universities do not give out honorary doctorates in the same way that American universities do, so it was a very elaborate ceremony. 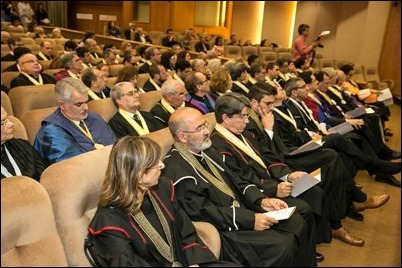 They had a choir that sang “Gaudeamus Igitur,” which I did not realize is sung at many European universities. Of course, many people associate it with the operetta “The Student Prince” as sort of a drinking song, but it is really medieval university song. They also sang an Irish song to honor my heritage. 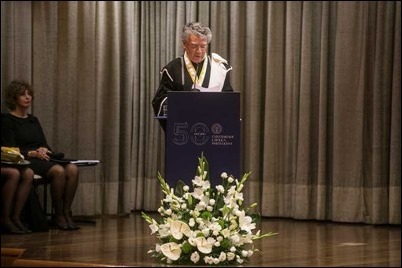 The university president gave an introductory talk and then they have a “padrinho” (which literally means “godfather”) who introduces the person being honored. 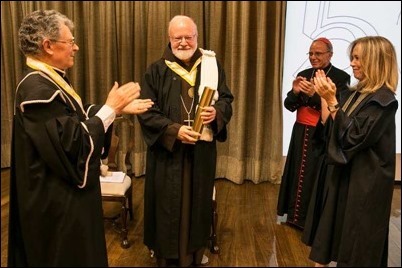 In my case, it was Father Armindo Vaz, a professor emeritus of the theological faculty, who gave a long exposition on why I was receiving this honor. It was very fulsome, to say the least! I enjoyed the first 10 minutes and then, after that, I was somewhat embarrassed! So, I prefaced my keynote remarks by telling the story about the Irish widow who was at her husband’s funeral Mass. The pastor gave a long sermon about all the husband’s virtues and good qualities and praising him profusely. So much so that, eventually, she sent one of the children over to look in the casket to make sure it was really her husband who was in there! 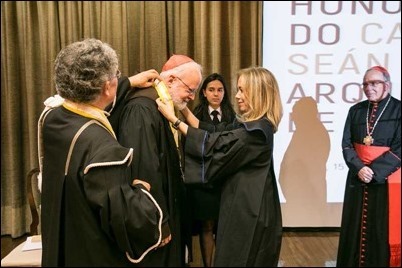 Then, at the end, Cardinal-Archbishop Manuel Clemente (who has the title of Patriarch of Lisbon) gave the closing remarks, which he abbreviated because everyone wanted to be home in time to watch the World Cup match between Portugal and Spain! So, after the reception, we went back to the house of my friends, the Lobão family, and watched the game, which resulted in a tie but saw a brilliant performance by the Portuguese star player Cristiano Ronaldo. I was very honored to receive this award. 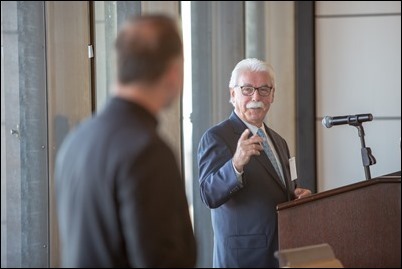 I have great affection for the Portuguese people and the Portuguese community here in America. 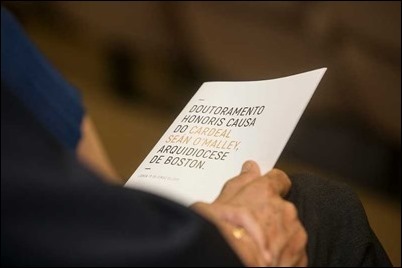 It was my great privilege for many years to have a Portuguese Parish in Washington, then being the Bishop of Fall River and now in Boston to continue to have close ties with the Portuguese community. 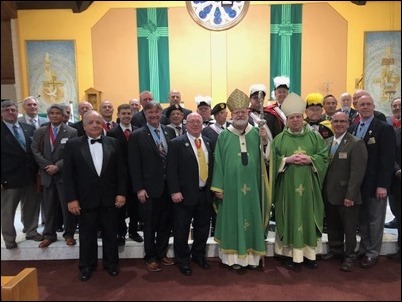 By Sunday I was back in Boston and went to St. William’s in Tewksbury for the Knights of Columbus’ Annual Boston Culture of Life Mass, which I concelebrated with Bishop Hennessey. We are so grateful for all the Knights do on behalf of the gospel life, promoting family life and helping our crisis pregnancy centers. For example, they have provided ultrasound machines that have been so important in our pro-life ministries. 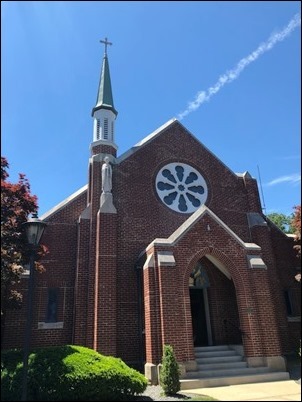 St. William’s is staffed by the Oblates of Mary Immaculate. So, after the Mass, we had a lunch with the retired OMI Fathers and Brothers, many of them had been missionaries in very remote parts the world for many decades. It was very inspiring to be with them. 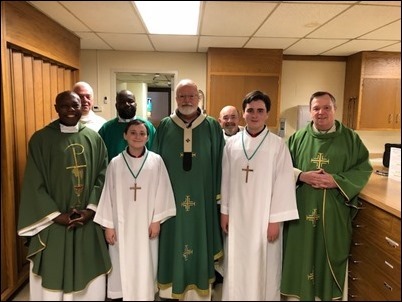 Later that afternoon I went to St. Bridget in South Boston where they were holding a dinner for some of the local priests hosted by Father Casey, who is always very good about hosting these types of gatherings. 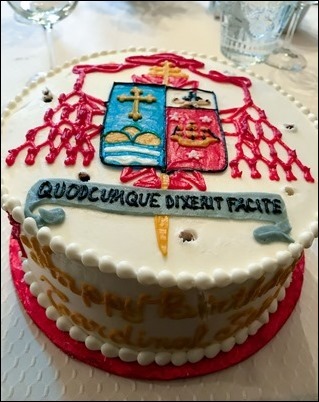 During the dinner, they surprised me with a cake with my coat of arms on it. Then, on Monday, we had one of our regular meetings of the board of St. John’s Seminary. 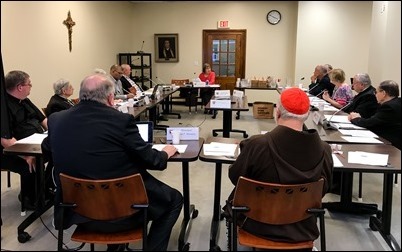 The board is working very hard to address the many challenges of growth at the seminary. We are very grateful for the active participation of our board members and all the support that they give to Msgr. 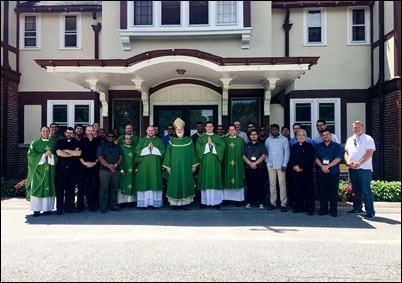 Moroney, the faculty and seminarians at St. John’s. 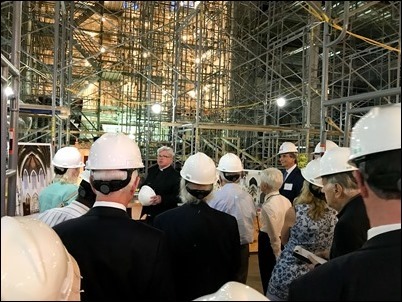 That evening we had a gathering at the cathedral for parishioners, benefactors and others who are interested in the progress of the renovations. We are anxious for people to see it, and offer people an opportunity to be a part of this project. We had a short program and then we took the people for a tour led by Father Kevin O’Leary to demonstrate the progress that is being made. We are very grateful to John Fish and David Manfredi, who are involved in the design and construction, for being part of the presentation. This is the first major overhaul of the Cathedral, and it comes at a very crucial time. We want to preserve this monumental, landmark church for the people of Boston and now is the moment to do that, in order to ensure that it is safe, beautiful and user-friendly for decades to come. We were pleased to be joined by a crew from WBZ TV who prepared a report on the work at the Cathedral. 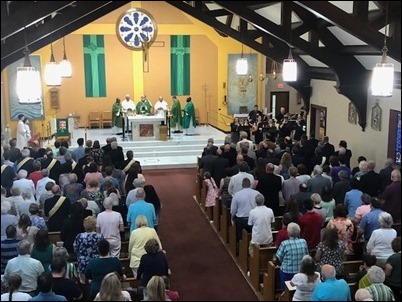 In fact, the cameraman told me that he was baptized, did his first Communion and was married at the Cathedral, and was a graduate of Cathedral high school! 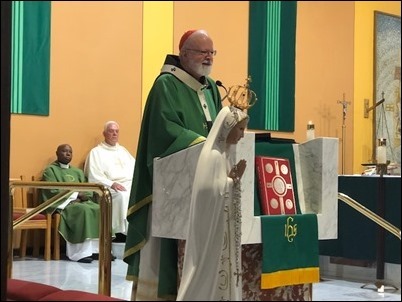 On Tuesday, I was back at St. Bridget in South Boston. 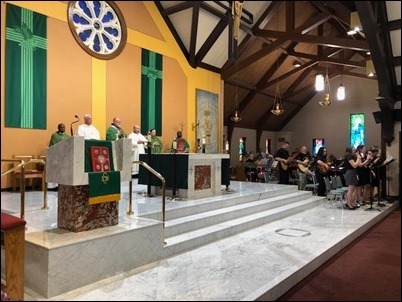 This time, it was for a gathering of young Benedictine monks from all over North America who are in formation and were brought together for an event by St. Anselm’s. Abbott Mark and Father Casey invited me to join them for a cookout. 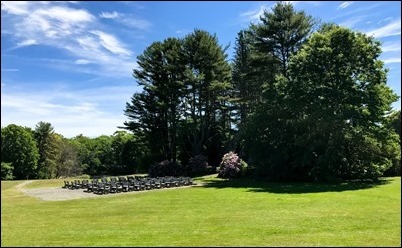 Wednesday, I went to Kennebunkport, Maine to join our seminarians who are there at the Franciscan Guesthouse on retreat. 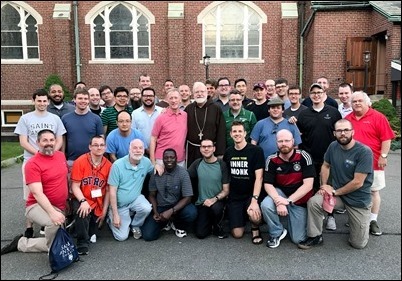 Every year, Father Hennessey of our Vocations Office and his team organize this event to gather all of our seminarians – those studying in Boston, Providence and Rome —to be together for a few days of retreat. 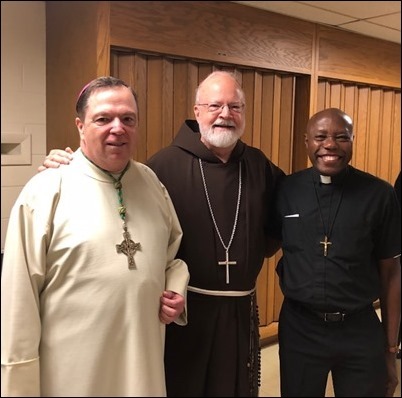 During their time together we bring in different diocesan priests to give talks, and I also always have a Mass and conference with them. There is a wonderful spirit among our men. We are so blessed and grateful for them. 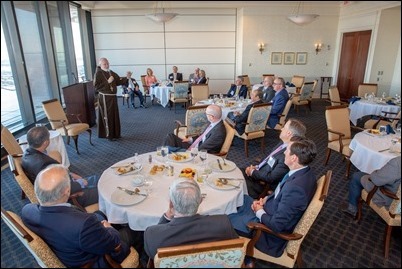 Thursday morning, I went to the Boston College Club in Boston for a breakfast meeting of the Celebration of the Priesthood Dinner Committee. This was a planning session for our upcoming dinner, which will be held on September 18. This will be our 10th-anniversary dinner, and we are pleased that John and Kathy White have consented to chair the dinner once again. We are also all very excited that Mark Wahlberg has agreed to be our guest speaker. This will certainly be a very special event, and I hope all of you in the Boston area will make plans to join us!